In Wayne Dyer’s early work he spoke about what he called “futurizing.” Suggesting that many of us are waiting to be happy based on “when” something might happen in the future, versus being happy today. Chances are you’ve done this before. At some point in your life you’ve probably said, “I’ll be happy when__________.” It’s not unusual, but it’s based on two presumptions – that happiness is dependent on a future event, and that there actually is a future. Dyer has also taught that, “The future is guaranteed to no one.” He’s right. There isn’t anyone who has that guarantee. Although we all must plan for things; when you are living “when,” you are not living now, which is all you really have. Many people live for the future, but we know it might not arrive. So it’s best to get busy with living for today, and looking for happiness in the moment. If you aren’t happy today, what day are you waiting for? This entry was posted in Uncategorized on April 1, 2014 by dave361. We wish there was a handbook for success, but there isn’t. Here’s the next best thing: a list of ways you can realize your dreams–and be a more productive person in the process. Wouldn’t it be great if success was simple? There’s no one-size-fits-all answer for success in work and life, but we will do our best to steer you in the right direction. 1. Get up insanely early. It sounds scary, we know, but consider what would happen if instead of watching reruns of bad movies at night, you went to bed at a reasonable hour, thus allowing yourself to wake up early and be SUPER productive? Waking up before anybody else allows you to work out the logistics of the day to come, track your time, and (most importantly) unplug for a few hours. After all, the early bird catches the worm–and much more, apparently. 2. Keep promises, no matter how small. Talk is cheap and meaningful customer relationships are built on promises. Same goes for your personal life, right? Success is built on mutually trusting relationships with just about everybody. If you say you’re going to walk the office dog? Well, you’d best walk the office dog. 3. Learn how to tell stories. You want to be successful in life, but you don’t have a job, or you’re looking for a new one. The first step to nail that dream job? Learn how to tell a great story–starting with your interview. Big companies know storytelling is the secret weapon to “branding.” Why? Because people don’t fall in love with data dumps and PowerPoint slides–they are moved by emotions. And for those looking to be in charge, the best–and most memorable–way to make an impact and stick in people’s minds is to ditch the small talk, and learn how to unspool meaningful narratives. 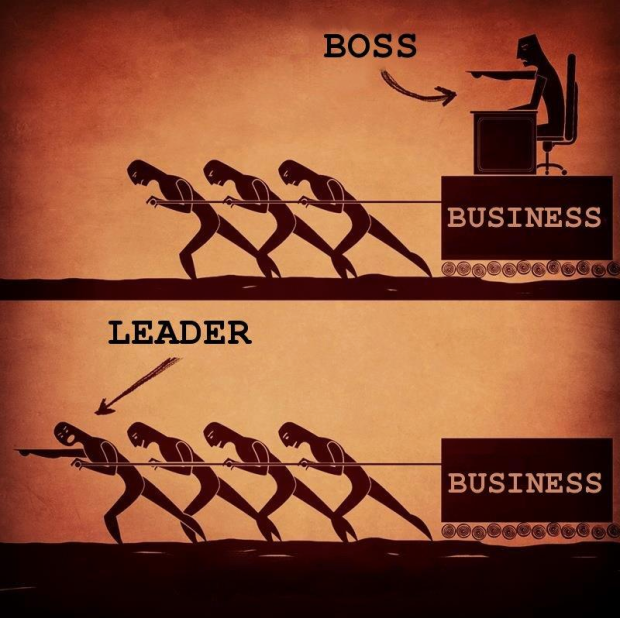 There’s a big difference between being a leader and being a boss. 5. Don’t be afraid–or embarrassed–of your failures. Sir James Dyson, creator of the famous Dyson vacuum (who recently came by and vacuumed the Fast Company offices), is no stranger to failure. In fact, he embraces it. Dyson’s point: If you want to discover something new, you’re bound to fail a few times (or in his case, 5,126 times), and that’s okay. It’s also okay to quit something your heart isn’t into, in order to get somewhere better. 6. Ask questions, a lot of them. Every company needs to pause occasionally for self-reflection. What is your purpose on earth? What should you stop doing? What is your petri dish? You’ve got all the answers, right? 7. Be honest–with yourself and others. Remember what we said about asking questions? Here’s a hard one: Are you passionate, or delusional? Delusion is a double-edged sword. When it comes to productivity, tricking yourself can be your best move, but if your career is hurting other (more important) aspects of your life it might be time to re-evaluate your priorities. Truth be told, I think the difference between passion and delusion isn’t even very distinguishable. I suspect many an entrepreneur has fallen too far down the rabbit hole without even realizing it. It happened to me. Maxed-out credit cards, empty cupboards, and a frustrated spouse helped me wake up to the delusion I created in myself. I was laser-focused on the belief I had to succeed no matter what, which led me to lose sight of reality. My story fortunately has a happy ending. But if I hadn’t faced that reality head-on (and it did indeed feel like a crash), I wouldn’t have been able to honestly evaluate my business and redirect toward a healthier course. Here at Fast Company, we devoted an entire month to Unplugging, or taking a breather from the endless hum of the digital world. You don’t have to completely unplug, but the effects of removing yourself for a few days, hours, or even weeks, can do wonders for your sanity and enable you to refocus your aspirations. A perfect example: Stuck on an idea? Take a walk. 9. Take notes and stay organized. If you’re trying to delve deeper than surface level engagement, try taking notes. It might sound silly, but put some genuine effort into it–note-taking is an important key to keeping your mind organized, and understanding better what it is you’re after. And with that, we bid adieu. If you have any habits that we’ve missed or should know about (like everyone else, we want to be more productive! ), please share them with us in the comments. Meantime, check in here, for the latest tips and tricks for success. This entry was posted in Articles, Success Wisdom on July 27, 2013 by dave361. 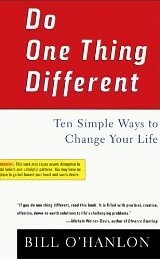 Change any one of what you usually do in the problem situation – do one thing different! For example: If you usually get angry and defensive, sit quietly and listen. Apply solutions from other situations where you feel competent. For example: What do you know on the golf course that you forget when you get behind the wheel of your car? What do you say to resolve a problem with an angry customer that you don’t say to your angry partner? Shift your attention by focusing on what you would like to have happen rather than on what is happening. Grounded in therapeutic practice, this bold and funny book will put you back in control of your emotions and life. This entry was posted in Read These Books on July 25, 2013 by dave361. With the recent release of the fifth edition of the American Psychiatric Association’s Diagnostic and Statistical Manual of Mental Disorders (DSM-5), leading experts in medicine are agreeing with what I have opined for years: The manual fails to accurately describe and classify psychiatric illness. I personally warned the President of the American Psychiatric Association (APA), face-to-face, that publication of the manual would be the beginning of the end of the Association’s credibility with professionals and the general public. A few months ago, I taped a debate about the upcoming DSM with the President of the APA, slated to air on the Dr. Oz show. After the APA President was seemingly unable to defend the Association’s positions on the manual, the show never aired. Now, Dr. Thomas Insel, director of the National Institute of Mental Health, has stated that the book is no longer the best way to categorize psychiatric disorders for research purposes. Translation: The 160 or so supposedly distinct disorders don’t hold up as truly separate illnesses that can be studied scientifically. The British Psychological Society has opined that the 160 disorders are of “limited reliability and questionable validity.” Translation: The American Psychiatric Association is inventing names for conditions that don’t exist. With each new edition of the DSM, diagnoses are added and jettisoned, in keeping with political pressure on the committees that came up with them and the desire of the authors to make the diagnoses neatly fit in with the effects of psychiatric medications, triggering payments from medical insurance companies. In this latest edition of the DSM, Asperger’s disorder has been jettisoned, meaning that the millions of people diagnosed with that condition as described in DSM-IV, were apparently suffering with something else. They will now be suffering from autism spectrum disorder, which happens to also include all the folks previously diagnosed with three other conditions, too. Interestingly enough, fully 50 percent of the DSM-5 task force and working group members who helped create the binge eating diagnosis have financial ties to the pharmaceutical industry. Being somewhat forgetful in old age is now, according to the American Psychiatric Association, a new disorder called minor neurocognitive impairment. And if you think Medicare won’t be billed many millions of dollars so that social workers, psychologists and psychiatrists can treat forgetfulness, or that pharmaceutical companies won’t suggest that their medicines work for it (and should be covered by Obamacare), you are mistaken. Another interesting fact: 89 percent of the DSM-5 task force and working group members who helped create this minor neurocognitive impairment diagnosis have financial ties to the pharmaceutical industry. This should be—but probably will not be—the last Diagnostic and Statistical Manual from the American Psychiatric Association, because the APA has lost its credibility as an organization able to accurately describe what patients suffer from and how psychiatrists actually heal people. It was under APA’s leadership and the commands of third-party insurers that the professional lives of thousands of psychiatrists were reduced to writing prescriptions for six patients every hour rather than talking to patients about their life stories. For those of us who always knew that psychiatric disorders are complex interplays of emotion and behavior and neurochemistry, who always knew that human beings need to be understood as individuals, who always knew that major depression is often heralded by terrible anxiety and that terrible anxiety is depressing, who always knew that many people with attention deficit disorder had plenty going on in their lives that no one would want to pay attention to, the DSM was always understood as a self-published, self-serving document that fell far short of reality and had limited value. Now, with the DSM-5’s release, the word is truly out: We in psychiatry need an honest, accurate diagnostic manual – and we don’t have one. Psychiatry also needs an honest professional guild, something we also don’t have. There is a ray of hope, however. There always is. This time, it is the selection of Dr. Paul Summergrad, as president-elect of the APA, the chairman of the department of psychiatry in which I teach, and one of the wisest psychiatrists I have been privileged to know. This entry was posted in Health News on June 4, 2013 by dave361. Today, I will let things happen without trying to figure everything out. If clarity is not available to me today, I will trust it to come later, in retrospect. I will put simple trust in the truth that all is well; events are unfolding as they should, and all will work out for good in my life – better than I can imagine. This entry was posted in Life Wisdom on May 21, 2013 by dave361. This entry was posted in Quotationary on May 20, 2013 by dave361. 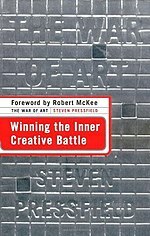 Simply put, The War of Art is a fantastic book about resistance. This entry was posted in Read These Books on May 15, 2013 by dave361.